It's been a busy day! 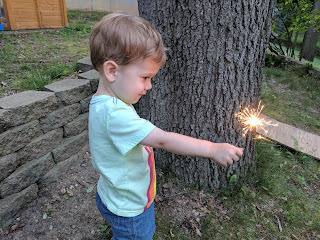 We went out to a parade, then came back and played at the house for a while. 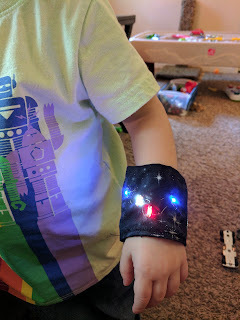 I made Quinn a light up bracelet for the fireworks in the evening. Edit: This was made with conductive thread, an Adafruit Gemma and LED sequins. And he enjoyed the evening festivities, when it started to get a little darker. Amazingly, he managed to stay up till past 10pm, so we were able to walk around the neighborhood and see the everything launching into the sky.